﻿﻿Third in a series of Fishing Presidents. Today, Harry S. Truman. Surprisingly, WikiLeaks has not yet released classified documents showing that President Harry S. Truman partook of offshore gambling while on vacation in Key West, Fla., in November 1946. That's right, President Truman gambled, and there was cheating involved. 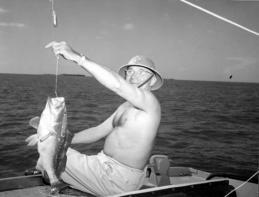 Today, in an Internet exclusive, we will reveal the facts behind this never-before-told story about when President Truman was on vacation and gambled on the outcome of a fishing trip. The classified documents* of the president's vacation were compiled by Chief Yeoman Charles J. Langello, U.S.N. As the story goes, two groups of dignitaries boarded separate fishing boats. As Clark Clifford, the president's special council, was boarding the Sandy and the president and his entourage were boarding the Dolphin, Clifford offered a wager for the biggest fish and biggest catch. President Truman accepted the bet. They then proceeded to an area four miles off the island of Dry Tortugas and began fishing. It can be revealed here that preceding the President’s fishing try on this trip, some members of the DOLPHIN’S crew had already caught some fish, and it was planned to weigh these fish in with the competing catch. While the President and his group were fishing, an occasional cheer went up from the SANDY, about 200 yards off our starboard beam, every time one of Mr. Clifford’s group caught a fish. It appeared that they were having better luck, though we in the DOLPHIN were hoping that the cheers were only sounded to impress us – and rightfully so, because they were having better luck – as we ruefully found out later. One of the fish Truman caught that day in 1946. 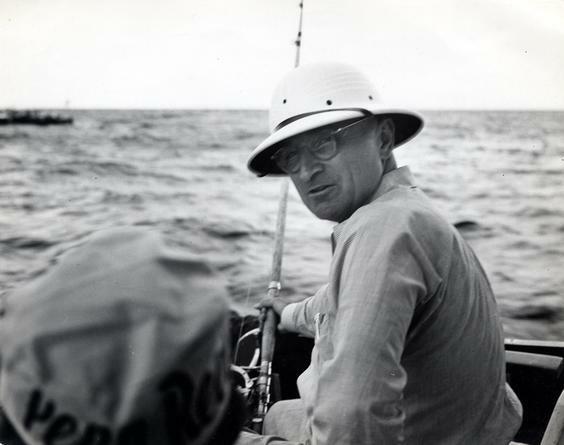 When it was learned that Mr. Clifford's group caught the larger weight of fish, the President confessed to Mr. Clifford that even weighing in the fish already on board the DOLPHIN when he started fishing, his group had failed to beat Mr. Clifford's group. Had it not, however, the President jokingly remarked he might not have confessed the perfidy [that is, the act of deliberate betrayal]. The bet was $5 for the biggest fish, $15 for the biggest catch. That would amount to about $55 and $165 in today's dollars. Some 64 years later, we remain unsure about whether President Truman ever paid off the wager. We're expecting WikiLeaks to release that information soon. *OK, maybe it wasn't "classified" in a top-secret way -- it was from the logs filed at the Truman Library -- but this is believed to be the first published account of Truman's Gambling-gate on the Internet.